Custom Home Building Process of FoxBuilt, Inc. Stressful, expensive, lengthy, stressful, over budget, painful, inconvenient…stressful! Sound familiar? Let’s replace those stereotypical building phrases with a new set of words: creative, on budget, enjoyable, valuable, and personal. By prioritizing our relationship with you, our goal is that every FoxBuilt client completes their building process with the second set of words. Working with the FoxBuilt team throughout the duration of your building project, rest assured that you will receive personalized attention and dedicated service. The home building schedule includes two phases: design and construction. The design process typically takes 1 month from our initial meeting through the completed custom design process (floor plans and specifications). For a home up to 5,000 sq. ft., the construction phase is 6 months or less. Many times we are able to complete your home weeks in advance. Our FoxBuilt customers are given the same quality design process, talented craftsmen, and personalized care regardless of whether they are building a new home or remodeling an existing one. John and Lisa work closely with clients to custom design each and every home. We are prepared to ask the right questions so that your wishes and needs are addressed in the design, all while keeping your budget in mind. The more questions we discuss in the design phase means less budget questions in the construction phase. 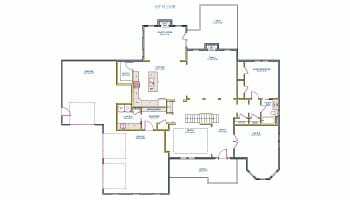 Lastly, the floor plans are presented to the client, modified following your input, and then finalized for construction. As we ready the construction site to break ground on your home, we will also meet with you to make design selections, such as flooring, counter tops, and fixtures. There will be periodic meetings throughout construction when other design choices will be made, including lighting, paint and landscaping packages. Browse a small sampling of a few current FoxBuilt custom designs. Watching your floor plans come to life week by week is a memorable experience. Please feel free to stop by your home’s site at any time–FoxBuilt is known for having clean and safe job sites, and we would be happy to walk you through and show you what has changed since your last visit. Because we operate a small crew of talented tradesmen, we are able to maintain competitive prices, tighter schedules and higher quality control. You will quickly see that our FoxBuilt team takes our work seriously while not taking ourselves seriously. Our pride in our work is evidenced both in satisfied customers and award-winning homes. Once construction is complete, we will perform a final walk-through with the customer. After settling in to your new space, check to make sure that all is as you envisioned. FoxBuilt also performs a 45 day walk-through, as well as a one year walk-through. We want you to be exceedingly happy with your home! Would You Like To Start a Conversation? We’ve designed our custom home building process to be stress-free and actually enjoyable! Contact us if you’re interested in scheduling a consultation or call 717-526-4075 to get started.